The Nashville Predators had balanced scoring and came from behind to defeat the Dallas Stars 4-2 Saturday night at the Sommet Center. It was a night where Halloween and college football were the clear winners in Nashville as many purchased tickets went unused as fans stayed home in droves. The losers were the fans who stayed home and missed a big win for the Predators who have fought back to the .500 mark and get back in the mix in the competitive Central division. The Predators goals came from Shea Weber, Steve Sullivan, Patric Hornqvist and Kevin Klein. The Preds out-shot the Stars 33 to 29 and the discrepancy was even greater when blocks and misses were considered with a 60-49 edge to the Preds. Pekka Rinne battled through a couple of early goals and really toughened up during the last half of the game stopping 27 of 29 Dallas shots. The game did not start well for the Predators as J. P. Dumont was called for hooking 3:00 into the contest. Thirty-one seconds later Steve Ott jammed the puck into the net when the defense was unable to clear the puck out of the blue ice in a messy situation. The momentum seemed to turn at 13:03 in the first when Dallas’ Mark Fistric knocked Joel Ward into the boards and Jerred Smithson quickly responded to Fistric’s actions putting both in the penalty box. On the ensuing power play, Shea Weber blasted a shot from the blue line that found it’s way through traffic and into the net past Alex Auld to tie the game at one. The second period started off in much the same way as the first with Dallas getting back on the board at 2:15 in on a shot from the circle by Brian Sutherby where Cody Franson may have partially screened Pekka Rinne. The Predators quickly had chances to tie the game but were stymied by Alex Auld twice, at 4:48 on a breakaway by J. P. Dumont, and at 3:50 when David Legwand went one on one with Auld from point blank range. At 12:45, Pekka Rinne made the save of the game as he stopped the puck several times in rapid secession, the last stop when he was in a horizontal position. The second period ended with some ragged man advantage play. After a questionable tripping call against Kevin Klein that looked more like a dive, Dave Scatchard was called for high-sticking. Dallas had 48 seconds of five on three advantage which turned into basically five on 2 ½ when Jerred Smithson broke his stick and could not get a new one. Dallas’s power play was cut short when Fabian Brunnstrom was called for hooking at 18:07 giving the Preds the man advantage for the final 1:36 of the period. The Preds were only able to get off a single shot and could not convert. The third period started in a more positive fashion for the Predators. At 3:17 Steve Sullivan took a short feed from J. P. Dumont and fed it through traffic into the back of the net to tie the game at two. Sully was clearly elated to score in what has been a frustrating season so far. By mid-period, Dallas was beginning to show fatigue from back to back contests as the Predators were keeping the puck in the Dallas zone for extended periods of time. At 10:59 the Predators broke through and were able to take the lead on a Patric Hornqvist goal that was one for the highlight films. After a mad scramble in front of the net and a hand pass out of blue ice bay a Dallas player the puck found its way back to the blue ice where Hornqvist was able to lift it over Auld’s shoulder. A minute later Joel Ward dug a puck out of the corner and fed it to Kevin Klein at the point who put the Preds up by two on a slapshot that went straight to the back of the net. At 13:30, a tired Dallas team hoped to catch a break when the officials went to video review on a stop made by Rinne where he fell to the side into the net and it was unclear if he had carried the puck with him. The video was inconclusive and the score remained 4-2. The Predators finished the game strong and were enthusiastic about the upcoming West coast road trip. The Predators made several roster moves prior to the game recalling Peter Olvecky and Andreas Thuresson in separate moves on Saturday. Cal O’Reilly was sent down to Milwaukee on Friday. Wade Belak, Alexander Sulzer, and Mrty Erat (lower body) were scratched for the Preds. The Predators will be off until Thursday when they begin a four game West coast swing in Anaheim. They do not play at home again until November 14 when they play the Montreal Canadians in a game that begins a streak of 12 of 15 home games in a 29 day period. In the second roster move of the day, and the third in two days, The Nashville Predators recalled Andreas Thuresson from Milwaukee. Admirals Shoert Shifts reported this earlier but the official move was just reported. Thuresson is taking part in the pre-game skate but it is unclear if he will make the final twenty that will be on tonight's game roster. Nashville, Tenn. (October 31, 2009) – Nashville Predators President of Hockey Operations/General Manager David Poile announced today that the club has recalled forward Andreas Thuresson (an-DRAY-uhs THUHR-eh-suhn) from Milwaukee (AHL). Thuresson, 21 (11/18/87), has five points in nine games for the Admirals in 2009-10, and scored the game-winning goal in Milwaukee’s 2-1 victory against Rockford last night. The Kristianstad, Sweden native notched 29 points (14g-15a) in 74 games for Milwaukee in 2008-09, and 18 points (11g-7a) in 77 contests as the American Hockey League’s youngest player in 2007-08. Nashville's seventh choice, 144th overall (fifth round), in the 2007 Entry Draft has yet to appear in an NHL contest. The Predators play their final home game until Nov. 14 tonight when they host the Dallas Stars at 7 p.m. Tickets to this game, and all other regular season contests are on sale and can be purchased by logging onto nashvillepredators.com. Tickets are also available by calling (615) 770-PUCK and at all Ticketmaster locations. The Nashville Predators (5-6-1) continue to try to battle out of the hole they created by losing six in a row earlier this month when they take on the Dallas Stars (6-2-5) at the Sommet Center tonight at 7 p.m.
Getting to the .500 mark at this point would be a considerable turnaround from their low point at 2-5-1 just ten days ago. Since that time, their play has improved, winning three of four, capped by their best game of the season on Thursday when the beat the Division leading Chicago Blackhawks 2-0. The Predators will go with Pekka Rinne in net tonight as has been customary after a goalie gets a shutout in the previous game. Rinne has not allowed a goal in his last two appearances which covers 99:06 minutes and 34 shots faced. The Stars lost in a shoot-out 6-5 last night at home against the Florida Panthers. Alex Auld was in goal for Dallas and will get the call again tonight as Marty Turco continue to be out with "flu like symptoms." The highlight of the game for Dallas was a first period hat trick by Stephen Reinprecht. The Predators called up Peter Olvecky this morning to take the roster spot of Cal O'Reilly who was sent to Milwaukee yesterday. Marty Erat continue to be "day to day" with a lower body injury and will not play. Jason Arnott (upper body) and Jordin Tootoo (hip flexor) may be able to return next Thursday when the Preds play at Anaheim. Admiral's Short Shifts is also reporting that Andreas Thuresson was sent to Nashville but there has been no announcement about any further roster moves for the Predators. This will be the third meeting of the month for the Preds and Stars. Nashville won the season opener in Dallas 3-2 in a shoot-out with Mike Santorelli getting the game winner. The Stars decimated the Preds on October 14 in Dallas when they won 6-0 in a game where the Preds were down 4-0 in the first nine minutes of the game. It was clearly the worst outing of the year for the Preds. The Preds are last in the league on the power play (11.1%) but have made strides over the last few games going 4 of 14 after a streak of going 30 man advantages without a goal. Dallas is 22nd in the league with ten goals on the power play for the season. Jerred Smithson has had short-handed goals in the last two games including the game winner against Minnesota on Wednesday and an empty netter at the end of Thursday's contest. His two shorties has him tied with several for the league lead. The Predators penalty kill has been vastly improved in the last few games as they have moved up to 23rd in the league at 76.2%. Dallas is 25th at 75.0%. After tonight's game, the Predators will be off until Thursday when they begin a four game West coast swing in Anaheim. They do not play at home again until November 14 when they play the Montreal Canadians in a game that begins a streak of 12 of 15 home games in a 29 day period. The Nashville Predators completed their swap of Cal O'Reilly for Peter Olvecky with Milwaukee this morning. Olvecky had three shots and no points in last night's Admiral win over Rockford. In his return to the Ads O'Reilly had an assist and was +1 for the night. Nashville, Tenn. (October 31, 2009) – Nashville Predators President of Hockey Operations/General Manager David Poile announced today that the club has recalled forward Peter Olvecky (PEE-tuhr ohl-VEHT-skee) from Milwaukee (AHL). Olvecky, 24 (10/11/85), has posted seven points (2g-5a) in nine games with the Admirals in 2009-10. A native of Trencin, Slovakia, the 6-2, 195-pound left wing split last season between the Minnesota Wild and the Houston Aeros, posting seven points (2g-5a) in 31 NHL games and 23 points (6g-17a) in 41 AHL contests. Drafted 78th overall (third round) by Minnesota in the 2004 Entry Draft, Olvecky represented Slovakia in the 2009 World Championships in April and May, notching an assist in five games. The elevator ride continues between Milwaukee and Nashville with Cal O'Reilly being returned to Milwaukee this afternoon. I am assuming that this means that Martin Erat's "lower body injury" has resolved. Nashville, Tenn. (October 30, 2009) – Nashville Predators President of Hockey Operations/General Manager David Poile announced today that forward Cal O’Reilly has been reassigned to Milwaukee (AHL). O’Reilly, 23 (9/30/86), was pointless in six games since being recalled on Oct. 15, averaging 13:00 per game. In the Admirals first three games of the season, he posted seven assists. The Predators play their final home game until Nov. 14 tomorrow night when they host the Dallas Stars at 7 p.m. Tickets to this game, and all other regular season contests are on sale and can be purchased by logging onto nashvillepredators.com. Tickets are also available by calling (615) 770-PUCK and at all Ticketmaster locations. Walking out of the Sommet Center after last night's game, I had the feeling that I had seen someone that I hadn't seen in a long time. The Nashville Predators team that plays with tenacity and grit and truly gets 100% out of each player on the team had returned. It was a completely different team than the one I saw before leaving on vacation two weeks ago to the night against the same foe. For those who had been watching the progress on television, I'm sure there were changes that could have been seen along the way. Having been completely away from any video until Wednesday night, I didn't see the change in stages but all at once. Hopefully, this was not a one game aberration and that the Pred team that played last night is the one of the future. A win Saturday against Dallas will bring them back to the .500 mark and place them in a position to do positive things on the four game West coast road trip and return home where they will then play 12 of 15 games at home. As a final note, the enthusiasm from all on "Hockey Fights Cancer" night was really sincere. After the game, many of the young cancer patients that attended the game met with J.P. Dumont and others outside the locker room and were having the time of their life getting to meet the players in person after the big win. There is plenty of news from last night's game. Here is the POTG story with postgame videos. 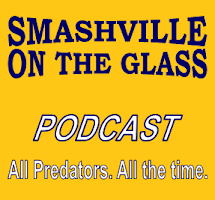 Here are stories from Predators.com, See Puck City, Jim Diamond, the Forechecker, Brandon Felder, and Fan Huddle. I'm sure there will be a few more this morning. In the MSM, John Glennon has two stories for the Tennessean (one, two) and one at Inside Predators. David Boclair from The City Paper filed this report. Here's are a couple of other stories from Chicago, one from the Sun-Times and another from the Chicago Tribune. As scary as Halloween can be, it could only be worse with a Terry Crisp look-alike contest. This and many other activities will occur at the Preds game Saturday night. Go here for details. Admiral's Short Shifts discusses the early season struggles of Pred's prospect Mark Dekanich. The Predators will have a "Breaking into Sports" Workshop on November 14 for those interested in a career in sports. Pete Weber talked Western Conference yesterday on XM 204's Hockey This Morning. From the Globe and Mail comes news that two former Ice Edge partners may be preparing a separate offer for the Coyotes. Pierre LeBrun claims that Steve Yzerman is whittling down his list of the finalist for Team Canada at the Olympics. Ryan at The RLD takes a look at who are the leading candidates for Team Canada's goalie spot in the Olympics now that the season has started. This appears to be "Mask weekend" at the NHL Network with numerous shows and features on goalie masks culminating with a 50th Anniversary show on Sunday night. Richard Pollock has an interesting study on blowout games since the lockout. The Preds are about where you would expect in the rankings. Origins of the nicknames of all 30 NHL Teams is at Mental Floss (H/T to the Forechecker). The Nashville Predators played their best game of the season in shutting out the Chicago Blackhawks 2-0 Thursday night at the Sommet Center. It was the first time this season that the Predators played one of their trademark games of solid defense, great goaltending, and just enough offense to come out on top. Pekka Rinne was the games first star, stopping all 22 Chicago shots and winning for the second night in a row. He was helped by a swarming defense that cleared pucks from the Preds zone consistently all evening. About his improved play Rinne said, "The last week or so, I've been feeling a little better." Further he said, "Every time you don't let in goals, it's going to build up your confidence. That's what I needed now. It's been a tough start for me, and for now things look a little better for me and the team." Rinne also gave credit to the defense, "Whenever there was a loose puck, our D would jump on it right away and it was easier for me that way." Pekka also commented on the fans, "Every time you jump on the ice here, you think about the fans. You play this game for the fans. It's our home and you want to win those games and keep those fans coming to the building and winning the games is a huge part of that." Joel Ward provided all the offense that was needed when he redirected a Francis Bouillon shot at a 90 degree angle at 14:53 in the second period for a power play goal. It was Ward's first goal of the season and he seemed relieved after the game to finally get the proverbial monkey off his back. Ward pointed to better team play in the last week, "We are all coming together really good. We never really doubted ourselves at all, we were just coming up short in a few games. We've been sticking together pretty good and with a little luck we've been sticking to the game plan and I think we will be alright." Jerred Smithson added a short handed empty netter with four seconds left in the contest to seal the deal for the Predators. Barry Trotz was pleased with the effort and noted the the Preds "had won three of the last four so we are making some strides." Further he said, :We are really pleased with this effort, last night we got in late after a tough game in Minney and there was a lot of fighting the dog today." He pointed to keys to the game, "They really went to the net hard, they battled, had lots of chances." The Predators had the majority of their 28 shots for the game on the power play with 18 coming on the man advantage. Trotz has emphasized needing more shots on the power play. About the effort he said, "You can't get too fancy about pretty plays, you keep pounding pucks, making good solid decisions, going to the hard areas and scoring goals and that's how you have to do it." A new injury appeared on Thursday with Mary Erat being a late scratch due to a "lower body injury" that was sustained in Minnesota. This is in addition to the ongoing injuries to Jason Arnott (upper body) and Jordin Tootoo (hip flexor). Trotz commented, "We've had a lot of injuries to key people. We've been sort of piecemealing it and we have a lot of adversity and are fighting through it." The Preds return to the ice at the Sommet on Saturday for the third meeting of the month with Dallas. The Preds will have the opportunity to fight back to the .500 mark with a win over the Stars before heading to the West coast for a four-game road trip. I know we have several readers who are big goalie fans so they will probably be interested in the special airing on the NHL Network on Sunday night that will celebrate the 50th aniverary of the goalie mask. NEW YORK (October 29, 2009) – NHL Network™ celebrates the golden anniversary of one of the seminal events in the League’s history on Sunday, Nov. 1, by premiering 50 Years Behind The Mask, a sweeping, one-hour special that will be broadcast in the United States and Canada at 7 p.m. ET. The program will be streamed live on NHL.com Sunday at 7 p.m. ET. An NHL Network original program, 50 Years Behind The Mask will begin 50 years almost to the minute from the moment when legendary Montreal Canadiens goaltender Jacques Plante revolutionized his position – and the sport – by donning a face mask in a League game. The program draws upon archival footage and interviews with Plante’s contemporaries to tell the story of that transformational night of Nov. 1, 1959. A visit to the Hockey Hall of Fame and Interviews with current NHL® goaltenders – including Cam Ward, Tim Thomas, Steve Mason, Chris Mason, Craig Anderson and others – advance the story to the present day. Nov. 1, 1959, became one of the landmark dates in NHL history when, during a game in New York between the Montreal Canadiens and the New York Rangers, a shot by Rangers forward Andy Bathgate struck Plante in the face, cutting him from the corner of his lip to his nostril. After having his face stitched up, Plante returned to the ice wearing a mask he had been using in practice. Despite the concerns of Plante’s coach, Toe Blake, that the mask would hinder his goalie’s performance, the Canadiens won that game, 3-1, and went on an 18-game unbeaten streak thereafter. As a result, the mask was here to stay. NHL Network was nominated for a 2009 Gemini Award in the Best Sports Analysis or Commentary Program, Series or Segment category for the “Brodeur: A Winner Above All” tribute program to New Jersey Devils goaltender Martin Brodeur. NHL and the NHL Shield are registered trademarks and NHL Network is a trademark of the National Hockey League. NHL and NHL team marks are the property of the NHL and its teams. All Rights Reserved. After a big win against a struggling Minnesota Wild team last night, the Predators (4-6-1) return home to face the Chicago Blackhawks (7-3-1) at the Sommet Center tonight at 7 p.m. It will be Hockey Fights Cancer Night in Nashville with partial proceeds going to the Monroe Carell Children s Hospital. The game will be a true test for the Preds to see if they have actually improved or simply took advantage of a team that was worse than they were last night. The Preds have faced the Hawks twice already in this young season losing 3-1 on October 15 in Nashville and 2-0 in Chicago last Saturday. Marty Erat is the only Pred to break through with a goal for the Preds against the Hawks. In an scheduling oddity, after tonight's game, the Preds and Hawks will play three more times in December and then be done with the season series which is unusual for a division foe. Chicago's last game was also against Minnesota when they beat the Wild 3-1 at home on Monday night. While the Preds were playing last night, the Hawks were relaxing in Nashville waiting for tonight's match-up. It will be interesting to see if fatigue becomes a factor in tonight's contest. It is unclear who will start in goal for the Predators after Pekka Rinne came to Dan Ellis' rescue in last night's contest. It is reported that Christobal Huet will start for the Hawks after he has held the Preds to one goal in two earlier games. The Hawks will be without Johnathan Toews but will get defenseman Brent Seabrook (who has been out for a week) back into the line-up. Marian Hossa practiced with the Hawks for the first time yesterday but is still weeks away from playing in a game. The Preds will pay at home again Saturday night against the Dallas Stars, while the Hawks will leave immediately after the game and go to Colorado for a game with the Avalanche tomorrow night. There were plenty of stories on last night's game including POTG, three from the Tennessean (one, two, three), Jim Diamond, Forechecker, What the Puck and See Puck City. The most impressive item today is Mark's (The View from 111) story and pictures from his parachute jump from 13,000 feet that we discussed on the radio show on Monday night. He really enjoyed it and gained additional respect for the skill and professionalism of all involved. Dirk the Forechecker was on Hockeybuzz radio last night before the game. It was a good show that you can hear it from the links here. John Glennon tells of a different kind of "morning skate" before last night's game. The Predators are having an online pumpkin carving contest where you can get Pred stencils and upload a photo of your artwork. Shake-ups in Nashville have had fallout in Milwaukee. Surprisingly, the Ads continue to struggle as they lost to Abbotsford 2-0 last night. Even with the call-ups, Milwaukee was expected to be one of the best AHL teams this season. The National Post reports that even after the NHL acquires the Coyotes next week a quick re-sell may not be eminent. Here's one no one could have predicted... Gaborik questionable with "lower body injury." How did he last this long? Here's something that we discussed with Russ Cohen on Monday's POTG Radio. Here are the six players from the Summer's Entry Draft that made it past the nine game mark with their NHL teams. Matt Reitz (who will be on next week's POTG Radio) at View from My Seats has a complete analysis of hits and suspensions taking a look at several from the past weekend with videos and rulings from the league as well as VFMS. This is a really good piece. Mirtle is waiting for the bubble to burst in Colorado in spite of the Av's big win last night in Calgary. In an odd move Newsday.com has gone to a subscriber only site. B. D. Gallof has the story. Puck Prospectus takes a look at which division is the toughest to play in. Three divisions are considered. The latest from fantasy expert Rob Higgins is at the Toronto Sun. The Rink Podcast Episode 51 with Eddie Garcia is up now. My favorite podcast, The One Percentile with Mick Kern and Eric Gage is Back with Episode #17. This week's Twitter #NHLPick15 is actually a pick 11 so go here to play. I would like to thank everyone for all my Twitter and Facebook Birthday wishes yesterday. One of the more unique items I received was a photo of a personalized Preds third jersey with my name and age on it from Josh Taylor. I even got the "C". It appears the Internet and I share a common birthday as 10/28/69 is pegged as its birth (and Al Gore was no where in site). Finally, an off topic item of local interest. The Nashville Fairgrounds is being closed which includes the Nashville Fairgrounds Speedway which was a mainstay on the NASCAR circuit for many years and hosted two major races a year until the races moved to bigger and better facilities across the country. It's just another bit of Nashville's history that is going by the wayside. If the Preds could figure out how to tap in to the local race fan base it would be an opportunity to introduce a new sport to the racing crowd that involves speed and hitting that race fans might enjoy. The Nashville Predators showed signs of life in Minnesota on Wednesday, defeating the Wild 4-3 in a game that included uneven play by both teams. Both teams have had disappointing starts that placed them in almost a "must win" situation. Nashville got on the scoreboard first at 2:36 on a goal by J. P. Dumont. They made it 2-0 three minutes later on a Shea Weber power play goal. The first period ended with the Preds up 2-0 with each team having seven shots. The second period was really hard to figure. The Wild scored three goals on three shots in the first 2:18 of action to go ahead 3-2. After Pekka Rinne replaced starter Dan Ellis, the Wild had only one shot for the rest of the period. The Pred's only score in the second stanza was on a shot by Joel Ward that went in the net off Mike Santorelli's skate for Santo's first NHL goal at 6:44 to bring the game back to 3-3. The third period was fairly evenly matched with the pace picking up and better skating an hitting by both teams. The Preds were held to zero shots until Jerred Smithson picked up a puck on a mis-handle my Marek Zidlicky to score a short-handed goal at 10:44 in the period. From that point on, the Predators defense stiffened and Pekka Rinne completed his prefect 37:42 in goal stopping all 12 Minnesota shots that he faced. Aside from the the three goal spree against Dan Ellis at the start of the second period, the Predators played one of their better games of the season. That brief meltdown is very disconcerting as this is similar to several other similar runs by opponents earlier this season. This type of win may be exactly what the Predators needed to kick start their season as they return home for games on Thursday against Chicago and Saturday against Dallas before heading out West for a four game road trip. This game will be considered a turning point if the Predators can parlay the momentum of this road win into a few more wins in the next couple of weeks. The Nashville Predators return to the ice tonight in Minneapolis for the first of three games in four nights against the Wild (3-8). After winning their first two games, the Preds have gone 1-6-1 and have only scored 17 goals in ten games, six of which were in their lone recent win in Ottawa. Minnesota has also had a disappointing start to the season losing all eight road games while winning their three home contests, all in OT. The Wild have several really ugly + - numbers with six players at -8 or worse, led by Brent Burns (-11) and Martin Havlat (-10). Both teams have been abysmal in putting the puck in the net with the Wild ranked 28th (2.o goals per game) while the Preds are last (1.7 gpg). The Wild and the Preds are both coming off losses to Chicago on the road, the Preds losing 2-0 on Saturday and Minnesota 3-1 on Monday. The Predators will match the leagues 30th ranked power play (8.3%) against the Wild's 2nd ranked penalty kill (88.1%). The Preds lead the league in fewest penalty minutes at 9.1 per game which could be indicative of their lack of aggressive play. On Monday, the Predators recalled Mike Santorelli from Milwaukee and sent Ryan Jones to the Ads in return. Santorelli played the first five games with the Preds with only a shoot-out goal to his credit. In four games in the AHL, Santorelli had four goals and four assists. Despite having a one-way contract, Jones was sent down after playing eight games with no points in limited minutes. Line combinations for tonight's game is anyone's guess. Coach Barry Trotz has played "fruit-basket turnover" with his lines in a desperate search for offense over the last few games and practices. There has also not been an indication of who will start in goal for the Preds but it may be Pekka Rinne since Dan Ellis played well against Chicago last Saturday and the Preds have a rematch with the Hawks on Thursday in Nashville. The Predators are expecting the return of defenseman, Dan Hamhuis who has been out for four games with an upper body injury. The Preds have already lost 26 man-games to injury in this young season and remain without the services of Captain Arnott (upper body) and Jordin Tootoo (hip flexor). With Hamhuis' return, the Predators are carrying seven defensemen and it is unclear who will be the odd man out. Cody Franson has played well in his four games since replacing Hamhuis on the roster so it is unlikely that he sit this one out. After tonight's game, the Predators will return to Nashville to face the Chicago Blackhawks on Thursday for the third time this season. On Saturday the Predators will face Dallas for the third time this season before heading out on a four game, two week road trip to the West coast. It will be critical for the Predators to play well during the games this week and on the road trip to be in a position to take advantage of the back loaded home schedule when they play 12 of 15 games at home when they return from their Western swing. Mark Willoughby of the View from 111 will be the guest expert tonight on HockeyBuzz Radio on WNSR at 6 p.m. with Paul McCann and Pete Weber. I'm looking forward to hearing Mark as he hits the big time radio circuit. John Glennon has a story on ex-Pred Greg Zanon. Bryan Mullen attended Tuesday's practice and confirmed that little could be gathered on lines or goalies for tonight's game. David Boclair has more on the Pred's lack of offense at The City Paper. Here are a couple of post from the Minnesota Star Tribune on tonight's game, one, two. The Wild are in the same boat as the Preds in needing to get something going. Two more Pred Prospects are set to play in the Super Series games against the Russians next month as Ryan Ellis and Michael Latta were named to Team OHL. Earlier this week, Charles-Oliver Roussel and Gabriel Bourque were named to Team QMJHL. Jim Diamond reports the suspension of Pred prospect Craig Smith of the University of Wisconsin for a hit from behind on an opponent in their game last Saturday. Jim also has a story on Greg de Vries who appears to have made Nashville his permanent home. Forechecker is now running a travel bureau at his site directing out of towners to cheap air fare via Southwest and discounted tickets to Preds games. Mike Barnes sits in as a guest writer at Section 303 and wants to see change, quickly. From @NHLPredsInsider: Arnott skates by himself today, but still out for the next couple games. Hamhuis in for tomorrow - but 7 d-men to stick around. It's good to see a little competition at D! Ad's Short Shifts has a preview of tonight's Admirals game against Abbotsford. David Legwand makes a top ten list of players needing a trade at the Hockey Writers. Here's an article on Colin Wilson by Alan Bass that I missed last week while on vacation. Colin Wilson was also on NHL Live yesterday. It's not official but word has been filtering out that the 2010 Entry Draft will be held in LA with the Kings as host on June 25 and 26. I guess earlier rumors of it being in Phoenix were incorrect. If the same schedule is followed as last year, the the 2010 NHL Awards would be on on June 17 in Las Vegas. However, the NHL has slated June 18 as the latest the cup would finish. So it is possible that he Awards show could be the same week as the draft. Sounds like a great time to kill about 10 days in the Southwest. It is on my vacation calendar already. Hockey or Die reports on the tenuous position of Ian Penny with the NHLPA. Earlier on Tuesday, agent Allan Walsh tweeted @walsha: Text mess from Chelios to Ian Penny-"Ian,when you r done can you pls call me + let me know what you 5 staff members are discussing with each other i would like to know being your guys Emplyer." Leaves no doubt Chelios is now running the NHLPA. Paul Kukla will be a special guest on tonight's edition of Chris Wassel's The Program on Blog Talk Radio at 7:oo Central. Slapshot addresses the issue of headshots and the NHL position on them (depends on which day it is ???) in a excellent article and commentary. Michelle Kenneth addresses the subject of whether a girl that is in to sports is actually a turn on or turn off to men. I do know that my wife scares me when she watches football, but I don't think Michelle is as rowdy as the wife. From @reporterchris: Sidney Crosby to carry Olympic torch on Nov. 18 in Halifax. Mike Wyman reviews Russ Cohen's 100 Ranger Greats for Inside Hockey. More exploits of the Psycho Puck Lady in New York can be found here. Finally, Bob Griese getting suspended by ESPN for a week for making a "taco" remark is political correctness run amuck. If he was sincere in his apology, that should have been enough. I've seen athletes get off for far more serious offenses with really lame "apologies". The object of the remark even joked about it. This is ridiculous! We has Navajo Tacos (that we learned how to make at Monument Valley) for dinner last night. I hope that isn't offensive to anyone. After a hellish return to work on Monday after vacation, I was revived by last nights POTG Radio show which was a lot of fun. Mark Willoughby from The View from 111 and Russ Cohen, author of 100 Ranger Greats were both great guests and we had a wide ranging conversation about the state of the Predators, Mark's jump out of a helicopter, and Russ's new book and the related tour. Russ also does the Prospects Show and Business of Hockey Show on XM204 so it was really interesting to get his insight on the Predators prospects as well as others from across the league that are on the cusp of breaking into the NHL. His weekend shows on XM have a new time at 3:00 Central on both Saturday and Sunday. I did admit during the show to a lapse in moral character (and judgment) on Sunday when I went to the Bellagio sports book and placed a $20 bet on the Predators to win the Stanley Cup this year. At 60-1, a miracle season run would easily pay for a trip to the NHL Awards show next June. My intent was to place a bet on the Anaheim Ducks who had been listed at 19-1 a week earlier which seemed like a good deal with a realistic outcome, but by Sunday that had fallen to 10-1 which was not as enticing. Looking forward, I see this week as the beginning of a turn-around for the Predators who could finish up the month well with a three game win streak before heading out on a two week West coast swing. These next seven games are critical in bringing the Preds back to the .500 mark and getting the team in position to taking advantage of back-loaded home schedule that is coming. John Glennon has an article about Dave Scatchard's return to hockey at the Tennessean. There is also news that Dan Hamhuis will return on Wednesday. Bryan Mullen reports even more line combos at Monday's practice, but it was before Mike Santorelli arrived back in Nashville so more changes are on the way. Jim Diamond has more on the Ryan Jones demotion. This is the second player on a one-way contract that the Preds have sent down to the AHL this season. Alexander Sultzer was the first after a marginal training camp. Jim also did a complete analysis and comparison between the first 10 games for the Preds for this year and last year. Taking a look at this information explains why the team is struggling. David Boclair at The City Paper has an in depth article on the financial shape of the Preds with information garnered from an interview with David Freeman. This is a must read for anyone who doubts the commitment that the current owners have to creating a successful operation in Nashville. At Hockey's Future, the Predators have moved up to number two in the NHL in the organizational ratings. This is not really surprising as the Preds are loaded with young players that are within a year or two of being read for NHL play. The complete depth chart with individual ratings can be found here. If you missed it, Admirals Short Shifts had an interview with Barry Trotz over the weekend that has some interesting insights. Charles-Oliver Roussel was named the QMJHL offensive player of the week, scoring seven point, all on the power play. Too bad the Preds can't call him into action. Roussel along with Pred prospect Gabriel Bourque are also set to play the Russians in the QMJHL Super Series next month. Big Kev returns and is clearly frustrated with the current Predator situation. The Preds practiced at A Game Sports (Southern Ice) in Franklin yesterday afternoon and here is one Dad's story of the G.O.A.L. Program and the kids getting to meet the players after practice. It is a must read for a feel good story. In Phoenix, Judge Redfield T Baum convened the Coyote's bankruptcy case again on Monday for a status hearing. Jerry Moyes finally agreed to sell the team to the NHL as reported in this AZ Republic story. Interestingly, Moyes and Wayne Gretzky will receive less than $10 million and the NHL will be repaid $37 million in temporary financing that has been used to run the team since last fall. It looks as if the sale will be completed next Monday. The NHL launched an "official" Facebook site on Monday. To this point, we have been unable to find it. The league is really doing a good job of being involved with social media on Twitter and now, Facebook. Update: Here is the link. In the Big Apple, two of my favorite hockey writers, @PsychoPuckLady and @MichelleKenneth, had lunch together yesterday. Even funnier is that it looks like Nick Giglia will also be joining the ladies today. We had both ladies and Nick on POTG Radio a few weeks back for some very interesting conversation. Katrina writes of her first day in the city at Psycho Lady Hockey. Ryan at the RedLightDistrict takes a look at a few major injuries and the players that need to step up and fill bigger roles. TSN's Power Ratings has a surprise at the top this week. Check it out. Mirtle looks at team by team attendance in this young season. Who would have thought that the SEC had a hockey league. I'm surprised. Here is the web page. From Hockeywood is a photo of Taylor Swift at the Kings game on Sunday night. She seems to get around to a lot of NHL Arenas. At least this time she wasn't sporting a Kings jersey. NHL Snipers points to a great save by Jonas Gustavsson in last night's game against the Ducks. A side note would be that the Leafs won their first game beating the Ducks 6-3. The Nashville Predators continued their hunt for a hot hand and increased offense by recalling Mike Santorelli from Milwaukee after he had eight points in four games with the Ads. Santorelli's primary contribution with the Preds in the first five games of the season was his shoot-out game winner in the Pred's Opening game in Dallas. The recall of Santorelli for a potential wing position is somewhat curious considering the Barry Trotz interview with Admiral's Short Shifts where Trotz indicated that Santorelli was better suited for the center position. It will be interesting to see how the line-up shakes out over the next few days. Ryan Jones, who has appeared to be in Barry Trotz's doghouse all season, was sent to Milwaukee to make room on the roster for Santorelli's return. Jones looked fairly good in the pre-season but has done little in the eight games that he played in the regular season. Nashville, Tenn. (October 26, 2009) – Nashville Predators President of Hockey Operations/General Manager David Poile announced today that the club has recalled forward Mike Santorelli from Milwaukee (AHL), and reassigned forward Ryan Jones to the Admirals. Santorelli, 23 (12/14/85), started 2009-10 with the Predators, suiting up for each of the club’s first five games (0g-0a). Upon being reassigned to the Admirals on Oct. 15, he registered eight points (4g-4a) in four games, including five points (1g-4a) in his 2009-10 AHL debut on Oct. 16 at Abbotsford and three goals in two games last weekend. Nashville’s sixth choice, 178th overall (sixth round), in the 2004 Entry Draft is pointless in 12 career NHL contests. Jones, 25 (6/14/84), played in eight of Nashville’s first 10 games in 2009-10, averaging 9:01 while being held pointless. In 25 AHL games a season ago, he posted 13 goals and 22 points. The Predators close out a stretch of five consecutive road games on Wednesday night when they travel to Xcel Energy Center to take on the Minnesota Wild (7 p.m., no local television, 104.5 The Zone). The club then returns to Sommet Center ice on Thursday night when the Chicago Blackhawks come to town (7 p.m., FOX Sports Tennessee, 104.5 The Zone). Tickets to this game, and all other regular season contests are on sale and can be purchased by logging onto nashvillepredators.com. Tickets are also available by calling (615) 770-PUCK and at all Ticketmaster locations. We are finally back from out Southwestern adventure and ready to gear up and pick up where we left off about ten days ago. I'm sure it will take a few days to get back up to speed as I had very limited access to the internet and ability to listen to the last four road games. From the limited information that I did see, it does appear that things may not be as bad as they seem if the Predators can right the ship this week and get on a streak with three winnable games on the horizon. As bad as things have been, the Preds are still only six points out of the division lead and a couple of points behind third place St. Louis. This will be an important week in seeing if the Predators can pull it together and play offense and defense in the same game and continue to build on a few positives that have come in the last four games. After a two week hiatus POTG Radio will return tonight at 7:00 Central when we will have Mark Willoughby from The View from 111 and Russ Cohen, author of 100 Ranger Greats. Russ also does the Prospects Show and Business of Hockey Show on XM204 and also runs the Sportsology media empire. I will be heavily dependent on our guests to bring me back into the loop on recent happenings in Nashville and around the league. Mark has been keeping tabs on the Preds for me and should have interesting insight into the current situation. I was able to read a good part of 100 Ranger Greats so I'm looking forward to talking to Russ about the book and some of their choices. We also will have Russ bring us up to speed on a few prospects that have broken through early in the season and who to watch for as call-ups in the next few months. Please join us live at 7:00 Central or after the show on the podcast. This is one in a series of "best of " posts that will run while I am in the hinterland of the American desert Southwest where Internet service is sporadic at best. Some are timely and some need to be taken in the context of the date of first publication. Enjoy and comment if you wish. Growing up as a kid in the South in the pre-video game era, summer days and after school afternoons were filled with whatever sport was in season at the time. Football in the fall, basketball in the winter and baseball or whiffle ball in the spring and summer were the order of the day. Being outside and playing sports was a year round passion that weather rarely hindered. So what about youngsters in the Northern parts of our country and Canada. How do they pass time in the middle of winter when daytime temperatures never approach the freezing mark and the ground is covered with snow for months at a time? The answer to that question is fully explained in the release of the new movie "Pond Hockey." The film would be considered a documentary by genre, but the story is told in a way that actually gives the film a beginning, plot and conclusion so it is much more than a History Channel type presentation. The movie begins with the origins of hockey when the only ice available was on frozen lakes, rivers and ponds and hockey was played seasonally as weather permitted. The framework of the movie is provided by the 2005 International Pond Hockey Championship, which was held on a frozen lake in Minneapolis, Minnesota and involved one hundred teams of all levels of playing abilities. The human interest part of the story that appeals to hockey fans and non-fans alike is a personal look at two individual teams, one a finalist (Federal League All-Stars) and another (Sofa King Lazy) made up of childhood friends who never grew up to leave the sport behind. You meet the individuals that made up the two teams and peek into their lives and see what drives them to play and compete outdoors under brutal weather conditions. Additionally, the film is interspersed with commentary by hockey legend Wayne Gretzky, current star Sidney Crosby and many other players that you have and haven't known. The movie was screened in limited release and is available as a DVD at PondHockeyMovie.com. This year's annual Labatt/USA Pond Hockey Championships was held on Dollar Lake in Eagle River, Wisconsin, as part of the Hockey Weekend Across America. Over 200 teams from 24 states participated. The following is actually off of Chris Wassel's The Program site where he combines something I wrote with his additions. The combination article has not run at POTG previously. Literally you never know what can happen at any time or any place. Like I have said and will say it again. There is a potential that the following could occur. If you piss off too many people and burn too many bridges...it does come back to haunt you. Yet the NHL never seems to learn its lesson. Unlike the MLB and NFL, the NHL does not have the revenue streams to compensate for their misgivings and foul-ups. After a couple of tweets with The Program's Chris Wassel yesterday, I got to thinking a bit deeper about the worst case scenario that could result from the deepening rift between the NHL and the NHLPA in the upcoming labor negotiations. Let's say things continue their downward spiral in Phoenix and one way or the other Jim Ballsillie does not receive a franchise. This leaves Jim with a bruised ego, plenty of money to spend, and a serious desire for revenge against Gary Bettman and the NHL owners. Ballsillie immediately appeals the initial ruling and files some type of anti-trust action against the NHL. While the case is moving at a snails pace, he decides to start a four team "Make It Seven" type league of his own with teams in Hamilton, Winnipeg, and a couple of other Canadian cities that will begin play next season (2010-2011). He overpays a few free agents (just like the KHL and WHA) and actually gets a product on the ice and makes it through the first season. By the summer of 2011, the NHL and the NHLPA have stalemated and a lockout looms. Owners have decided not to sign players for a season that is unlikely to happen because they want to take advantage of a new "controlled cost certainty" system that they are willing to risk losing a season for as part of a new agreement. At this point, the economy has made a turn for the better and credit has loosened. Big Jim sees the opportunity to expand his league and adds eight teams with four more in Canada and teams in New York, Boston, Chicago and Detroit. Many top unsigned NHL players with the urging of their agents, who see fresh money, decide to give it a go in the Jim league since the NHL arenas are dark for another season. ESPN has been enamored with all the controversy and they never liked Bettman anyway. They pick up a few games in the new league that do better than expected in the ratings and then at mid-season sign a deal with Jim that gives him a few more dollars (American) to play with. Meanwhile, Bettman, the NHL owners, and the other players are sitting on the sideline wondering what happened. From here, you can let your own imagination run wild as to the eventual outcome, but I would imagine that Big Jim would own a team in the revamped/merged NHL and would carry a lot of weight in the circle of owners that survived the lockout and anti-trust meltdown/settlement. And now Part Two of the hockey apocalypse....Road Warrior style. So as the hockey bombs were tossed in midair. A thought came to my mind. Bettman sometime in 2012 (The Mayan end of the world) starts to think it might be time to talk merger turkey with Jim Balsillie. Imagine the thoughts running through Balsillie's head as he remembers all the times the "gang of eight", Bill Daly, Gary Bettman, and company ruined his chances to own an NHL franchise. All Balsillie really wanted was a team of his very own in Canada and maybe he was too brash for his own good but the bottom line is the Jim league is a runaway success with no shootouts or god awful gimmicks. The league is officiated much more efficiently than the NHL. Less controversy and ESPN notices this quickly. It is like old style early 1990's hockey and they love it. After the first fraction of a year, ESPN signs a 5 year extension with JB giving him some deep pockets to go after Bettman and the NHL. Slowly more players get ready to cross as the free agency period heats up for the upcoming 2011-12 season. Gary Bettman realizes he better get an agreement now before its too late. The reality is it already is way too late. Players are looking to sign with the Big Jim league and the product is what entices them...not necessarily the money. By now one year into the lockout, the NHL has lost too much money and too much credibility to be able to rise from the ashes this time. The mushroom cloud appears poised to explode on what was the NHL. Just imagine the big red cloud in the sky and no its not from Russia with love but out of nowhere the Russian players who were too ticked off to play in the NHL come in droves to Big Jim's league. Gary Bettman even now sees the writing on the wall and cowers in fear as Bill Daly tells him it is time to surrender. From there all the anti-trust lawsuits and ugliness seem like a distant memory. What is left of the NHLPA and NHL comes crawling to Jim Balsillie. It really is like the dog that just got left out in the streets to fend for itself. Ragged and bruised and beaten...the NHL and NHLPA beg for a merger with the Big Jim league which now has expanded to 12 teams with 4 more slated for the 2012-13 season. All Bettman can do is try and find a way to merge his 30 teams with this league. Unlike the WHA where there were only a few teams....this merger takes some time. However it does eventually happen and Bettman is basically forced out with Bill Daly as a temporary commissioner until a more suitable permanent can be found. By the 2013-14 season...the new NHL with 30 teams is on ESPN and the product looks circa 1993 with bigger, faster, and stronger players than ever before. Ratings are through the roof...they easily surpass the NBA and compete toe to toe with even MLB on ESPN. Execs at Fox notice this and agree to a split regional lineup with ABC. ABC takes weekends and regional for the first half of the season and Fox takes over that coverage in the second half. They pay a pretty penny to the league who has to give a good portion to old Jim Balsillie who's Hamilton Bulldogs play to sold out crowds at the renovated Copps Coll. which is now called Bulldog Palace. The NHL then forms new antitrust agreements with the Canadian Parliament and the U.S. Congress. They finally get transfer agreements in with every major country in the world, even Russia. By 2014-15...the new NHL is raking in the dough and all owners see a revenue sharing package that works and a salary cap that though it seems high at 75 million with a floor of 57 million....it is something that all 30 owners can easily afford. Yes, one or two teams still struggle a bit but it is nowhere near as bad as it was just five years earlier. So out of the ashes of the old NHL comes a new league not wrought with infighting and strife but with labor harmony and a different outlook on how to market itself and help all of its 30 teams. Sure it was a rough road and one that was very narrow. However, all the unnecessary drama and threats seem like distant memories from generations gone by as opposed to just a few short years. Now this more than likely will not happen but if Gary Bettman and company keep going down their road while Paul Kelly and the players go down their road. It leaves the doors wide open for someone with very deep pockets to come swooping in and truly bring the fans what the NHL deserves....a profitable league with a product the fans can be proud of. You never know. After being the object of scorn and ridicule earlier this season for tasteless comments made before a game in Calgary, Sean Avery has returned to New York City and was toasted as the first star of the game on national television Sunday Afternoon. In six games with the New York Rangers, after his return from suspension and banishment to the minor leagues, Avery has four goals and an assist and has been the consummate team player. On Sunday his two goals led the Rangers to a 4-1 victory over Philadelphia in Madison Square Gardens to avenge the Rangers loss to the Flyers on Saturday. Avery has not been just another player on the ice in the three games that I have seen him play, one in person in Nashville, and the other two on the tube. He has basically been the hardest working player on the team, hustling and being around the play on every shift. Last Thursday in Nashville, Avery scored a goal and was in the blue paint causing trouble for Preds Goalie Dan Ellis on two other goals. During warm-ups, Avery showed no signs of the unfriendliness and aloofness attributed to him by his former Dallas team mates. Avery’s suspension in early December, while playing for the Dallas Stars, was based on a league rule regarding “conduct unbecoming to the game”. As part of his “rehabilitation”, Avery received “treatment” for anger management and it appears so far, some type of sensitivity training on how to fit in with his team mates. I asked Gary Bettman about Avery’s future last month when the commissioner was in Nashville. Bettman explained, “He’s welcome back from a league standpoint. He’s served his suspension and is under contract with the Dallas Stars. It will be a club decision (Dallas) as to what to do with him. He would have to clear waivers to return to the NHL with another team since Dallas has indicated they don’t want him”. Bettman’s vision for Avery’s return played out just as it was stated. On March third, after playing eight fairly uneventful games for the AHL Hartford Wolfpack, Avery was placed on re-entry waivers and picked up by the New York Rangers. There was speculation that the Rangers’ new coach, John Tortorella, was not fond of the pick up and had been openly critical of Avery’s actions this year and in season’s past. With Avery’s current good behavior and contributions on the ice, I’m sure “Torts” is feeling better about the situation (for now). With six games under his belt as a key contributor and a model citizen, questions remain. Has Sean Avery been “cured” of the problems that have plagued his career both on and off the ice, or is he a ticking time bomb waiting to explode at an inopportune time? Only time will tell. Watching from afar from the desert Southwest, things really seem to have fallen into disarray over the last couple of days in Pred-land and we have had very limited access to internet and 3G phone service to follow the goings on. For the second and third periods on Saturday, we were up in the deep walls of Zion Canyon with no outside communication. As we emerged, with what little we could gather from Twitter posts, we couldn't sort out the final score or even who won. After hearing the positive tone of a few tweets it was disappointing to hear that it was an OTL. We were also slow to hear about Arnott's injury and Laakso's poor play which prompted the following announcement by the Predators. With the Preds headed into Boston on Wednesday, we are hoping for a big night for Colin Wilson in front of all his friends and family. I'd say move him up to the first line center spot and let him roll. Nashville, Tenn. (October 20, 2009) – Nashville Predators President of Hockey Operations/General Manager David Poile announced today that the club has recalled defenseman Alexander Sulzer (al-ehx-AN-duhr SUHLT-suhr) and forward Dave Scatchard (DAYV SKAT-chuhrd) from Milwaukee (AHL). The Predators also assigned defenseman Teemu Laakso to the Admirals, and placed Jason Arnott on injured reserve. Sulzer, 25 (5/30/84), has six points (1g-5a) in five games for the Admirals in 2009-10, good for fifth (tied) among AHL defensemen. The Kaufbeuren, Germany native appeared in two NHL contests for the Predators a season ago – the first two games of his career – becoming the first German-born player to suit up for Nashville. Scatchard, 33 (2/20/76), has a team-leading three goals and 17 penalty minutes in four contests for Milwaukee this season, his first regular season action since he played 11 AHL contests with Milwaukee and Hartford in 2007-08. The Hinton, Alta., native has played in 635 career NHL games since the 1997-98 season, amassing 263 points (125g-138a) with Vancouver (1997-2000), the New York Islanders (2000-04), Boston (2005-06) and Phoenix (2005-07). Laakso, 22 (8/27/87), appeared in each of the Predators first seven games of the 2009-10 season, did not register a point and had two penalty minutes. The Predators play the second of five straight away from the Sommet Center tomorrow night at TD Garden in Boston (FOX Sports Tennessee, 104.5 The Zone, 6 p.m. CT). The club returns home on Oct. 29 when the Chicago Blackhawks (7 p.m. CT) visit Nashville. Tickets to this game, and all other regular season contests are now on sale and can be purchased by logging onto nashvillepredators.com. Tickets are also available by calling (615) 770-PUCK and at all Ticketmaster locations. For several weeks I have been complaining that the NHL All Star game has lost its luster and was no longer relevant. After two days of viewing the Skills Competition and the All-Star game itself I still have mixed feelings about its relevance. On the positive side, Commissioner Gary Bettman’s prayers were answered on Sunday. I doubt he could have written a better script with an overtime eleven all game that ended with the hometown hero scoring one shootout goal and the best player in the world scoring the other. On the negative side, no matter how the game turned out, very few folks in the United States, especially casual fans, saw the game or even knew how to watch. On a non-NFL football Sunday in January, the game should have been front and center on NBC in the middle of the afternoon not buried on the Versus Network at an odd 5:00 Central start time. The primary thing that I learned after two days is that the NHL has a new poster boy for the game of hockey. The league has tried for three and one-half years, with some success, to anoint Sidney Crosby as the face of the sport. On paper, he was a good choice being Canadian with a boyish charm that looks great on television. Playing for the Penguins, he has been schooled by Mario Lemeiux in how to “be the man”. Marketing can only go so far. At some point pure skill and production will rise to the top. At this point, Crosby is no longer the best player on his own team having been supplanted by Evgeni Malkin. Additionally, for the second year in a row, Crosby was unable to compete in the all-star setting due to an injury. Sitting on the sideline is not something kings are supposed to do. The true face of the game at this point has to be Washington’s Alexander Ovechkin. He and Crosby both entered the league in 2005, after the lockout season. During their careers Ovechkin has more goals, more points and plays a more aggressive all round game. Last season, not only did Ovechkin far outdistance the rest of the league with 65 goals, he was ninth in the league with 220 hits, a category uncommon to most recent top level goal scorers. The one final feather in Ovechkin’s cap is his magnetic, free for all personality. His “mini show” during Saturday’s skills competition was the only thing that saved the evening from being a complete dud. Granted, Zdeno Chara, broke the record for hardest shot but that is not what gets talked about at the water cooler. Alexander Ovechkin had Russian rival Evgeni Malkin dress him in a wide-brimmed hat, with a mini Canadian flag flying to appease the fans, and Elvis like sunglasses. Malkin further anointed him as the king of cool by dusting him off and giving him a squirt of water. “Ovie” then took off with two sticks on a mission toward the goal. He tossed one stick, missed on his shot, then drilled the rebound through the goalie's five hole. Long after the All-Star weekend has passed, the image of the young Russian, crowned with an everyman fishing hat and glasses, capturing the heart of the crowd will not soon fade. In one moment, the transformation occurred. Alexander Ovechkin went from being the world's best player to become the new King of Hockey. What could be better than sitting in front of an HD TV on New Years Day watching two of the best teams in the NHL playing high tech pond hockey in historic Wrigley field? Growing up in the South as a child in the sixties, New Years Day was set aside for the Rose Bowl Parade and four of five college football bowl games on a grainy black and white television. With few games being televised during the regular season having a full day of action was nirvana for a kid with a limited view of the world outside of small town Columbia, Tennessee. Over the years, with cable and satellite TV and the digital revolution of the Internet, the uniqueness of college bowl games has diminished substantially. From a slate of 10 to 12 traditional bowls in the 60’s to a list of 34 mostly insignificant match ups with compelling names like the “Magic Jack” bowl you can watch a game or two every day from mid December well in to the New Year. Games affecting the national championship have been removed from New Year’s Day and spread over a period of a week, mostly during prime time at the whim of network dollars and ratings. As the landscape changed a void was created for something compelling and entertaining for the masses of folks sitting a home on a cold winter holiday. Last year, for the first time, the NHL and it’s television partners gambled that a new fangled pond hockey game featuring league poster boy, Sidney Crosby, at Buffalo’s Ralph Wilson stadium would attract a few viewers and improve ratings for NBC’s limited weekly NHL coverage in the US. What they got far exceeded any marketer’s dream. With the backdrop of a sold out football stadium, beautifully decorated with gently falling snow arriving almost if on the director’s cue, the game on the midfield frozen pond was scripted perfectly. If I didn’t believe in the absolute integrity of the NHL and the best athletes in the world of sport, I would have thought it was planned out in a room full of Hollywood’s best writers. How else could you have it come down to Sidney Crosby winning it all on a penalty shot after sixty five minutes of action. As well as Winter Classic One was received both in and out of the world of hockey, there was still debate and a feeling that an outdoor game should only be held every few years so that it would not lose it’s “uniqueness”. The smarter folks in the home office prevailed and Winter Classic Two was spawned and placed in the heartland of America with an original six traditional match up between the Wings and Blackhawks. The decision to make it an annual event may be what brings the NHL back to a true “big four” pro sports status in the United States. With the NHL being buried on cable and an occasional NBC weekend game, there is little chance for a non-hockey fan especially in non-traditional markets to acquire a taste for a game that is better viewed in person than on television. On New Year’s Day the Winter Classic is becoming a must see for sports fans everywhere. From an event standpoint, what the Super Bowl is to football, and Daytona is to auto racing, the Winter Classic is to hockey and now it is the poster child game of the NHL. From the first time I saw the “Take Me Out to the Ballgame” video promo until now as I sit and watch the rendition of “Take Me Out to the Hockey Game” and the aesthetic beauty of the Wings and Hawks playing the game as competitively as any Stanley Cup final, I have been in hog heaven enjoying every aspect of the build up and the game itself. For the players, it’s a game that they would kill to be a part of as demonstrated by the return of Nick Lidstrom and Chris Chelios from injuries ahead of schedule specifically in order to participate in this special game. From early in the first period when Brent Seabrook drilled Dan Cleary and knocked him over the boards to the floor of the Hawk’s bench to the handshakes at center ice at the end of the game there was never a lack of intensity or focus on winning. The defending Stanley Cup champ Red Wings fought hard to come back and win over the hometown favorite Blackhawks by a 6-4 margin. The Winter Classic game last year was an “event”. This year’s Winter Classic II (now worthy of a Roman numeral) is the birth of a “tradition” that will be instilled in the fabric of the hockey season for years to come. Mid-day on New Year’s Day will now mean one thing for hockey fans and future fans, who may be checking out hockey for the first time, the annual Winter Classic. With rumors of interesting settings and top quality teams in future games, the old school college bowl games of yesteryear have been replaced with the tradition of the future, the NHL’s marketing superstar, the Winter Classic. Could Triston Grant Be the Next "Joel Ward"